Not able to make an event or retreat? THIS IS THE GUIDE FOR YOU! Two Weeks To Recharge can be done in the comfort of your own home over the span of 2 weeks making you feel recharged, inspired, and refreshed. The Two Weeks To Recharge Guide! 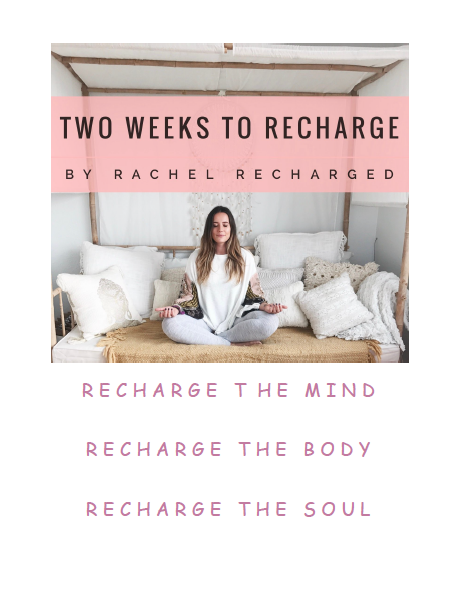 I am so excited to share some tips and tricks to get you feeling recharged in just two weeks! This Recharge Guide focuses on mind, body, and soul. 5 Journal Entry Templates to recharge your mind! 3 Guided Meditations and a How-To-Guide if it’s your first time meditating to recharge the soul! 3 At-Home Workouts to recharge your body! 4 of my Go To Recipes to refuel the body! You may wonder “why do I need to recharge?” The answer is simple: because self care isn’t selfish. Because your mind, body, and soul are meant to be taken care of. We deserve it. In a world full of craziness, allow yourself to recharge to the best version of yourself. Go to the paypal dropdown below to purchase yours! It will be sent directly to your inbox upon purchase. ENJOY!